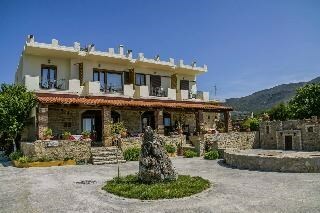 A genuine Cretan experienceA traditional family taverna and rent rooms in the heart of Crete, situated in the village Thronos near Rethymnon. Aravanes is the place to be if you seek for a genuine Cretan experience and a taste of the world-known Cretan hospitality! Aravanes is situated in Thronos village, only 32 kilometers South-East of Rethymno. Just 7 kilometers from the historic Arkadi Monastery and near Ancient Eleftherna and the new museum that is worth visiting. Thronos is situated at an altitude of 540 meters, on the western foothills of Mount Ida (Psiloritis), overlooking the breathtaking Amari valley.Thronos is a small picturesque village that has 32 inhabitants. In the past, it was full of young people as well as kids who used to play together in their houses or in the village's roads.